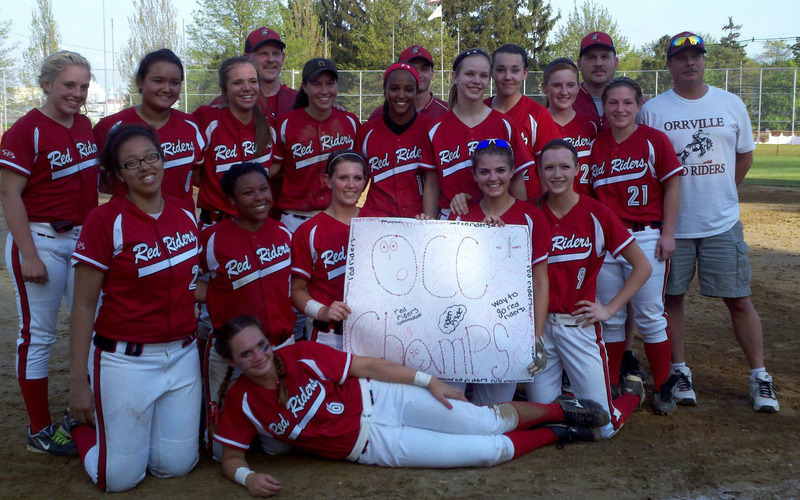 Orrville Red Rider Sports Blog: Orrville Softball Clinches OCC Title! The Orrville Red Rider softball team put a wrap on their first ever OCC title tonight, beating rival Wooster 9-2 in front of a packed Mizer Field. They improved to 12-0 in conference play and 18-3 overall. It's only the 2nd OCC title for any Orrville spring sport (girls track won the OCC in 2008) and one of just a handful of team conference titles since joining the league in 2003. I know football has shared an OCC title and we've won at least one in girls basketball and volleyball each. But it's been slim pickings other than that. Thanks to softball parent Lisa Kauf for the great photo. In the 12 OCC games this year, the Riders have outscored opponents by a combined score of 128-15. They have two games with 2nd place Ashland next week standing in their way of a perfect run through the OCC....and they have a shot at scoring 200 runs this season. I have them at 190 runs scored through 21 games (9 runs per game average). And now for some politicking...it would be a real shame of head coach Craig Johnson didn't win OCC Coach of the Year and Daily Record Coach of the Year. He should get some consideration at the district and state levels as well in my opinion. I'm sure plenty of players will garner some postseason honors and they deserve every last one of them. Hard to believe this team was only good enough to nab a 4 seed at the upcoming Creston district, but that's all the respect they received. Here's the district bracket. The Riders will open tournament play on May 10th at 4:30pm against the Dalton/Hillsdale winner. The game will be played at Orr Park. Congrats again to the Riders, their coaches and fans on a real big accomplishment. Here's to a clean sweep of the OCC and a deep tournament run. In this 2011-12 school year of so many area teams winning state titles (Norwayne in football, Waynedale in wrestling and Hiland in basketball), wouldn't it be sweet for an Orrville team to add their name to the list....in softball of all sports?